Stand on any block around lunchtime near Amazon.com's downtown Seattle headquarters and there are two common sights: people walking their dogs and people buying lunch at food trucks. 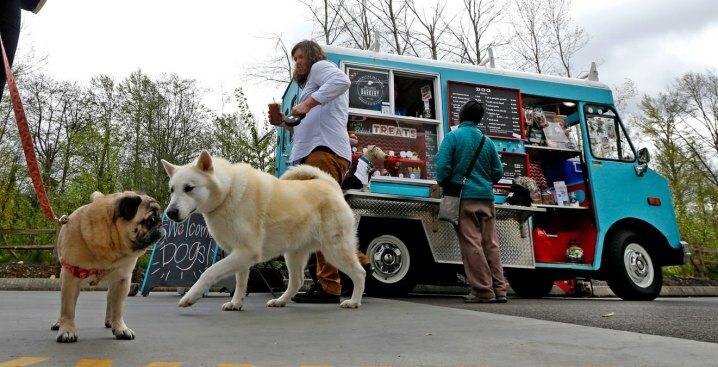 The scene offers a window into Seattle's infatuations with dogs (and cats), which outnumber children here, and the maturing roaming food truck market. Now, one truck is combining both by catering to humankind's best friend. "It kind of seems natural that now that we've conquered the people food truck market that we bring that to our faithful furry friends," Janelle Harding said. 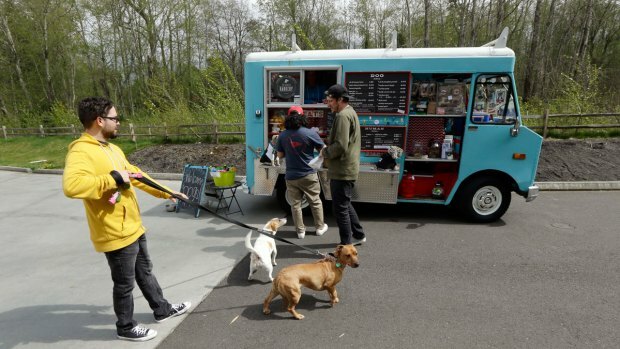 Harding is a customer of The Seattle Barkery, a food truck that serves dogs and their owners in Seattle-area dog parks, office building parking lots, farmer's markets and private events. It rolled into operation 10 months ago. "There is definitely a market for more things like that, where human and canine activities are combined. You don't want to always leave them at home or leave them in the car," said Dawn Ford, who owns and operates the truck with her husband, Ben. By Ford's count, their truck is one of just a handful in the country that caters to canines. The concept is new and rare enough that dogless people occasional misunderstand and purchase a treat. "They end up ordering something, and they seem weirded out by it," Ford said. Popular offerings include air-fried chicken feet and duck neck, cupcakes with bacon, rebranded "pupcakes," mini cheesy doughnuts, pumpkin pretzels and peanut butter-banana cookies. "Peanut butter is like a must," Harding said after buying treats for her pug, Stella. Ford worked at one of Seattle's dog-friendly bars, then became a dog walker and began cooking her own treats for customers following a rash of product recalls. "All of our treats are soft," she said. "All of our treats aren't filled with ingredients you can't pronounce." Giving dogs homemade treats rather than processed ones is deeply important to Ford. "What we feed our animals reflects their health," Ford said. "Animals' lives are short. If we can feed them good quality products, why wouldn't you?"